Photograph courtesy of The Minnesota Spokesman-Recorder. 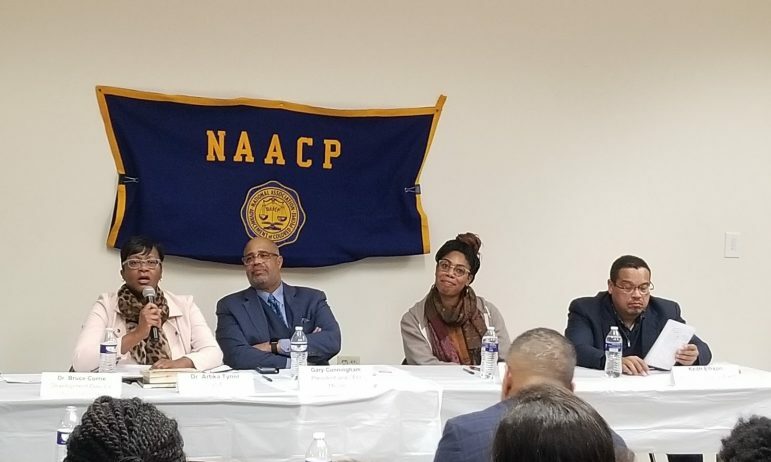 The myriad racial disparities and issues affecting Black Communities in the Twin Cities have caught the attention of the National NAACP, which has announced that it will create an Economic Inclusion Plan (EIP) for the Twin Cities. This plan will include measures to address issues such as mass incarceration and economic injustice as well as entrepreneurship and rising education costs. At a leadership gathering in December, moderated by Minneapolis NAACP President Leslie Redmond, handpicked panelists from both Minneapolis and St. Paul areas were brought together, all “recognizing that these economic disparities are impacting both of us and that we need to be able to work together and move forward,” said Redmond. Past Minnesota USA Fellows are also an illustrious group of artists: Frank Big Bear, Jonathan Muecke, Toni Pierce-Sands and Uri Sands, Ranee Ramaswamy, Mary Ellen Childs, Morgan Thorson, Carlyle Brown, Siah Armajani, Michael Sommers, Dominique Serrand, Sandra Benitez and Susan Power. Short term and unstable land access pose a problem for urban farmers who depend on a long-term relationship with a particular area of land for their livelihood. Taya Schulte and Seamus Fitzgerald operate Growing Lots, a working urban farm in South Minneapolis that grows vegetables, operates a community-supported agriculture program, or CSA, and sells produce to local chefs. Soil development is a critical aspect of urban farming, “In general, it takes three years to build up organic matter and turn it into workable soil,” Fitzgerald explained. Growing Lots lost access to one of their three leased sites in 2018 because its Longfellow landlords decided to sell. Due to a combination of neighborhood development pressure and the complication of renting to urban farmers, the land owner opted not to work to continue to lease to Growing Lots. However, there are new and upcoming measures to support and stabilize municipal land access for urban farmers, such as Homegrown Minneapolis, a city initiative dedicated to promoting local food systems. It oversees the city’s Garden Lease program, which rents out vacant and unused public land to urban gardeners and has worked to remove other structural and policy barriers to urban farming. Other policy players getting involved in this issue include The Minneapolis 2040 Comprehensive Plan and the Park Board. Read the whole story at Southwest Journal.